The fast food chain is adding cream liqueur to its batter for a new Irish-themed range – and according to this ad, we’re seriously missing out. IT’S A LONG WAY from Tipperary – but fast food giant KFC is wooing customers in China with a new Irish-themed range of chicken. The restaurant chain, has released an ad for the new “Taste of Ireland” recipe, which seems to involve adding a Bailey’s-like cream liqueur to the frying drumsticks. The promotional clip shows Chinese chefs nervously handing the new dish to an ‘Irish’ customer – who looks suspiciously tanned to us – before smiling in relief as he pronounces it delicious. 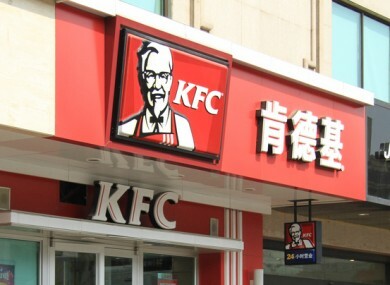 KFC has been hugely successful in China, operating more than 3,000 franchises across the country, Bloomberg reports. According to the official site, three chunks of Taste of Ireland chicken would set you back 9 yuan – or about €1. Email “KFC China introduces 'Taste of Ireland' fried chicken”. Feedback on “KFC China introduces 'Taste of Ireland' fried chicken”.